If you missed last Saturday's Illusion Necklace class, here's your chance to take it on Saturday July 23rd or Saturday July 30th from 9-10 am. Bring a friend and save. The regular fee of $15. per person is reduced to $12. each for you and a friend. Call Anita at 603-522-6529 or send an email to make a reservation. 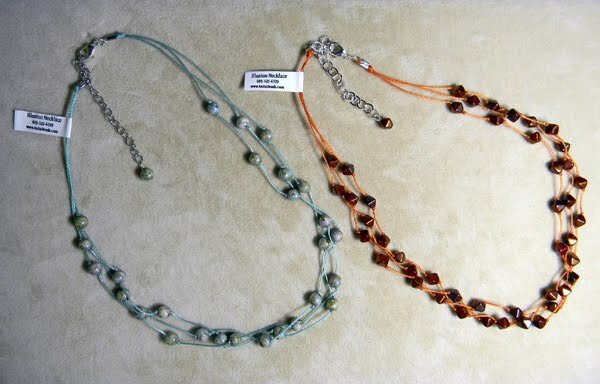 I have become totally addicted to making these necklaces now that I've discovered how fantastic they looked worn layered in multiples! 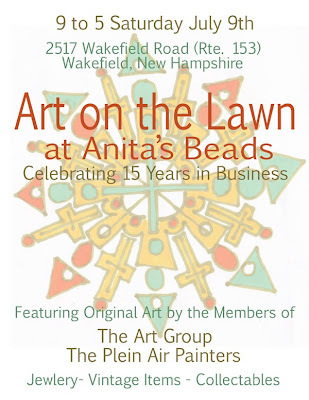 Visit Anita's Beads on Saturday July 16th at 9 a.m. for the first in a series of Summer Classes. This session will be a drop-in class so there is no need to pre-register. The class will run for one hour, and the fee is $15. per person, all materials included. There will also be all necessary tools on hand for you to use. We will be making 25-bead Czech glass Illusion Necklaces. 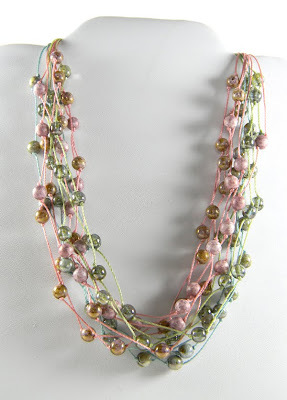 In the class you will learn: knotting between beads, spacing knots evenly, application of fold-over ends, how to open and close jump rings, and the use of a head pin to create a dangle. This same class will be scheduled on other days and times throughout the summer so watch this blog for further announcements. Step 1 - Assemble four dangles for each bracelet bead. 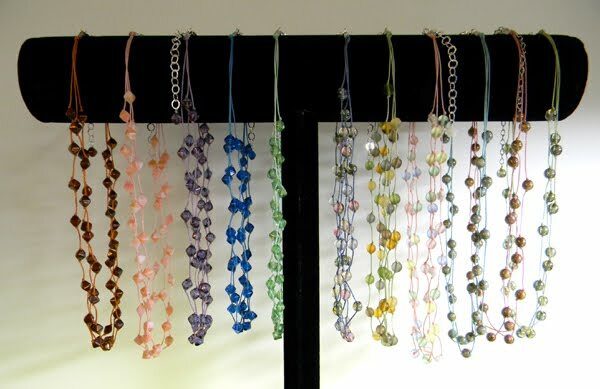 Daily Bracelets will have between 7 and 10 bracelet beads (between 28 and 40 dangles) depending on a) the size of the bead in your particular design and b) the size of your wrist. 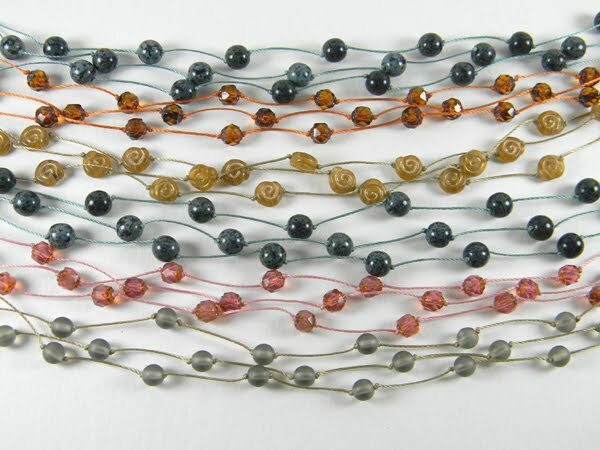 On each headpin add (in order) one seed bead or crystal bicone, one dangle bead, and one metal heishi spacer bead (or bead cap if working in SP or GP). 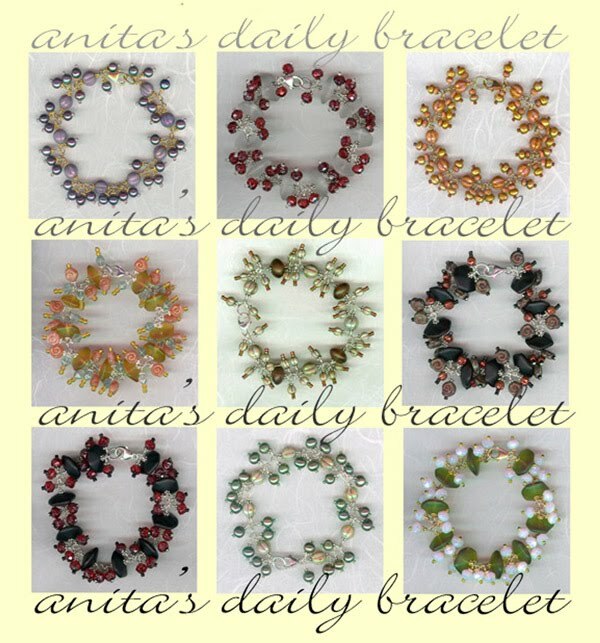 Note: Refer to the photograph of your Daily Bracelet on Anita's Daily Bracelet Blog as you work. Click the photograph for an enlarged view. Step 2 - Bend one assembled headpin to a 90-degree angle using chain-nose pliers. Pinch the headpin wire just above the metal heishi spacer bead (or bead cap if working in SP or GP) with the TIP of the chain-nose pliers and bend the remaining top section of the wire 90 degrees. The portion of the wire held in the tip of the pliers is the SPACE which will allow you to make three wire WRAPs (3 complete turns) to close the LOOP which will be make in Step 3. The straight piece remaining after the bend is the TAIL. Step 3 - Turn a LOOP using the round-nose pliers. Position the wire near the tip of the round-nose pliers so a small LOOP will be made. (Make note of this position and use it for all of your dangles so the LOOPs will be of uniform size.) Pinch the wire TAIL just after the bend. With the round-nose pliers in a vertical position (viewed straight on the tips of the pliers will look like this: 8) bend the TAIL up and over the top and then down until it forms a partial Loop. When the TAIL touches the other wire and you cannot wrap it any further, slide the wire off of the top of the pliers and move it to the bottom. Now you can continue wrapping the TAIL around until it forms a complete LOOP. Step 4 - Using your chain-nose pliers, grasp the LOOP across two wires for a secure hold. With your other hand bend the remaining TAIL around the space which remains between the LOOP and the metal heishi or bead cap. It should take approximately 3 WRAPS to fill the space. Step 5 - Using your wire-cutters, clip off the excess wire TAIL that remains, cutting as close to the WRAPs as possible. If a small snag is left, you can push it close to the WRAP with the tips of your chain-nose pliers. Step 6 - Repeat Steps 2 through 5 to complete the remaining dangles. Step 7 - Using your chain-nose pliers, grasp one piece wire at a point one-third from the end and bend the wire in a 90-degree angle to form the shape of the letter L. Note: One of the wires in your kit has already been bent and looped as a sample. Step 8 - Using your round-nose pliers, grasp the wire by the short section just at the bend. You will need to make a LOOP which is approximately 2mm in diameter (like your sample) so you will be grasping further back on you round-nose pliers in comparison to where you formed the LOOPs on your dangles. (A larger LOOP is required to give your dangles room to move around once the bracelet is assembled.) With the round-nose pliers again in the vertical position (8) bend the TAIL up and over the top and down until it forms a partial LOOP. When the TAIL touches the other wire, slide the wire off of the top of the pliers and move it to the bottom. Now you can continue wrapping the TAIL around until it forms a complete LOOP. Step 9 - Repeat steps 7 and 8 until you have one wire for each of your bracelet beads. The number will vary depending on which bracelet you are making. See: Step 1. Step 10 - With your chain-nose pliers, open the LOOP of one piece of wire enough to slide on one dangle, then the ring of your lobster clasp, and then another dangle. Close the LOOP with your chain-nose pliers. Step 11 - Using your chain-nose pliers, grasp the LOOP across two wires for a secure hold. With your other hand, grasp the TAIL and wrap it around one complete turn. Trim off the remainder of the TAIL close to the wrap with your wire-cutters. You should have what resembles an eye pin with a closed LOOP holding your clasp with a dangle on each side of the clasp. Step 12 - Add a heishi spacer (or bead cap if working in SP or GP), followed by a bracelet bead, and then another heishi spacer (or bead cap) to the wire. Then bend the wire 90 degrees with your chain-nose pliers directly after the second heishi bead. There should be no space between the heishi and the bend in the wire because you will only be wrapping the TAIL once after forming another LOOP. Step 13 - Using your round-nose pliers, grasp the wire just at the bend. You will make a second LOOP which is approximately 2mm in diameter (matching the size of your first LOOP). With the round-nose pliers in a vertical position (8) bend the TAIL up and over the top and down, forming a partial LOOP. When the TAIL touches the other wire, slide the wire off of the top of the round-nose pliers and move it to the bottom. Now you can continue wrapping the TAIL until it forms a complete LOOP. Step 14 - With your chain-nose pliers, open the LOOP you just made enough to slide on one dangle, a soldered jump ring, and then another dangle. Close the LOOP with your chain-nose pliers. Step 15 - Using your chain-nose pliers, grasp the LOOP across two wires for a secure hold. With your other hand, bend the remaining TAIL around to form one complete WRAP. Trim off the remainder of the TAIL close to the WRAP with your wire cutters. You now have the first bracelet UNIT with four dangles and a soldered jump ring to which you will attach another piece of wire. Step 16 - With your chain-nose pliers, open the LOOP of another piece of wire. 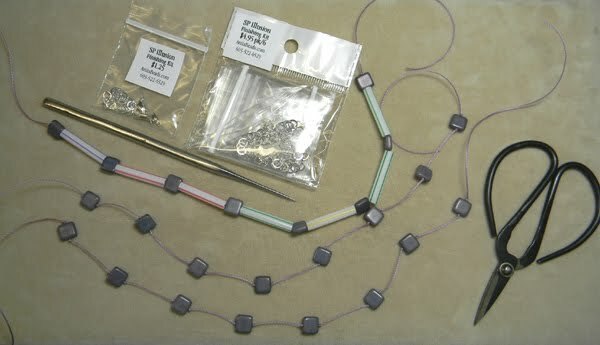 Add one dangle to the LOOP, then slide the LOOP onto the soldered jump ring attached to the previous bracelet UNIT. Add a second dangle and then close the LOOP with your chain-nose pliers. Step 17 - Using your chain-nose pliers, grasp the LOOP across two wires for a secure hold. With your other hand, bend the remaining TAIL around to form one complete WRAP. Trim off the remainder of the TAIL close to the WRAP with your cutters. You should again have what resembles an eye pin with a closed loop and two dangles attached to the soldered jump ring at the end of your previous bracelet UNIT. Step 18 - Repeat steps 12 through 17 until you come to the second LOOP of your last bead. Add a dangle, then the second half of your clasp, and then the last dangle before closing the LOOP. 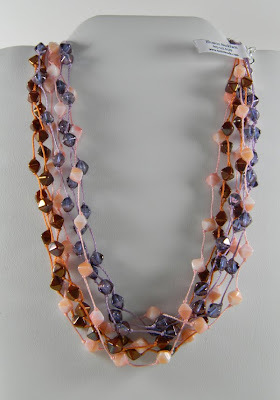 The most common mistake is to forget to add dangles before closing the loop. 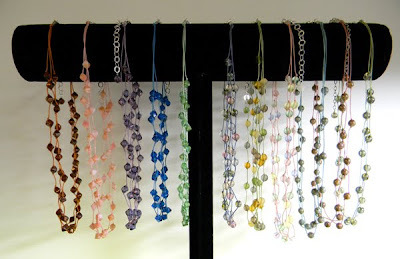 I can make a bracelet in about 1.5 yours (one hour to create dangles and then 1/2 hour to assemble). If you have not had much experience working with wire, figure on 3-4 hours to complete. This is an advanced project. Take frequent breaks if you feel the need. 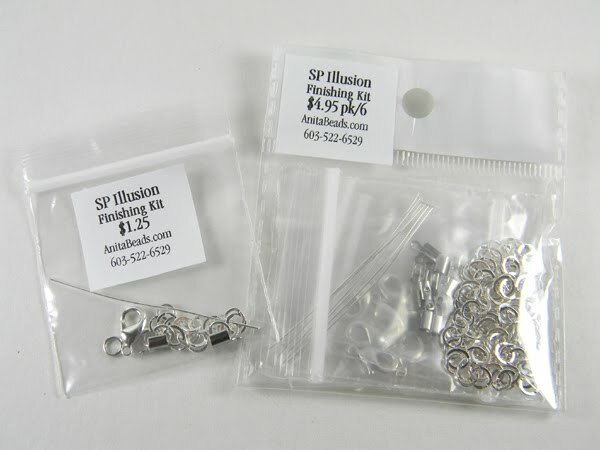 Visit the shop during business hours with your wire and bead kit materials and I will gladly assist you if you get stuck. Bead Club meets Monday and Thursday afternoons from 2-4 and is a good opportunity to receive free instruction. I also offer instruction to individuals by appointment. My fee is $35. per person for a 1.5 hour session. With my assistance you will complete your bracelet in one session. Telephone the shop at 603-522-6529 for more information or to schedule an appointment. Bead Kits and Metal Kits (in sterling silver, gold-filled, silver plate, gold plate, antique brass and gunmetal) are available at Anita's Beads. Finished bracelets may also be purchased at the shop. See all the designs on Anita's Daily Bracelet Blog. 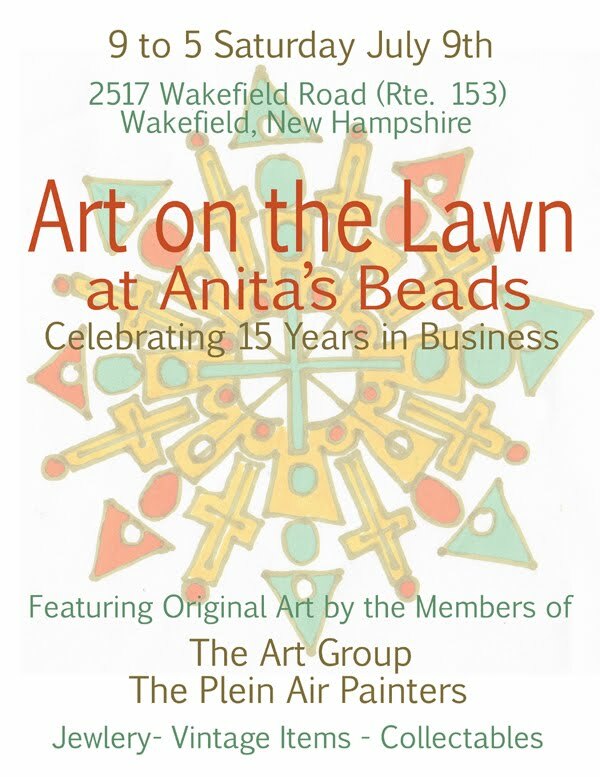 Please join us in celebrating Anita's 15th anniversary in business on Saturday July 9th with "Art on the Lawn" at Anita's Beads. Featured will be original art by members of The Art Group and The Plein Air Painters, plus jewelry, vintage items, and collectables. Hours are 9 to 5 and the address is 2517 Wakefield Road (Route 153) just one mile from NH Route 16. Contact Anita at 603-522-6529 for more information.